Do you need Peachtree support on an obsolete version of Peachtree Accounting Software that Sage is no longer providing support for? First Accounting Business Solutions by JCS has provided Peachtree Support for all current and older versions of Sage 50cloud formerly Peachtree Accounting Software. Second Get your Free test upgrade when you purchase the Sage 50cloud software upgrade thru JCS. If you need data repair or company rebuilds estimates can be provided. We have experienced consultants to help you. Are you frustrated when Sage support is very busy during the end of the year? Most importantly their technical support staff you will talk to are temporary not really knowledgeable in business and accounting. If you need outstanding Peachtree support give us a call 800.475.1047. How do I find information and examples of Peachtree Errors and how to resolve them? Do you offer Peachtree Support and will you help me with Sage 50 and Peachtree company rebuilds? Because we offer experienced Peachtree support and have years of experience in accounting, business and technical systems. When you have questions we have answers. If you have error messages we can determine if they can be fixed. Besides when you need help upgrading your software don’t you want to get the best price? When you put your trust in us and make your purchase thru us we will perform a free test upgrade as a part of you purchase bundle and your can purchase Peachtree support as you go. Our Peachtree support staff help small businesses just like your on all versions of Sage 50 formerly Peachtree Software. Accounting Business Solutions by JCS’s staff has hands on experience and strong product knowledge. Let us become your resource for support and training. Our Sage 50 and Sage 50C Consultants are uniquely qualified to deliver custom Accounting Solutions services. We can help you with inventory control, job costing, business Intelligence, payroll bar coding, custom reports and more. We offer over 10 training classes on all versions. Come learn how to manage your Peachtree data & financial information. Our team wants to be part of your Peachtree Support Team. Success for us is based on customer care, not call volume like other firms. Your business deserves more than the lowest priced support. You deserve the best! Telephone support is available for all customers but is not a substitute for training. Your information is kept confidential during your Peachtree support sessions. Find help for Sage Peachtree Software. Small businesses ask what is Sage Peachtree Software? Peachtree software was written beginning around 1985 to support small business accounting processes. 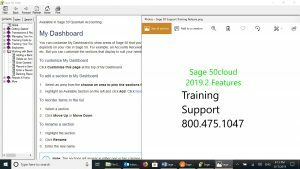 It then evolved to Sage 50 Accounting before 2010 and is now knows as Sage 50C Accounting and is perfect fit for small business and is easy to setup and use.